Who Else Wants To Save $5000 On Identity Management (IAM / IdM) Projects? What if I told you that in just 4 short hours from now, you could master identity management (IAM/IdM) concepts? And within 5 hours, your team could be saving valuable project money, time, and resources? And with your knowledge, you could save over $5000 on consulting fees alone? That there is finally a way to break through the walls of frustration, time, resources, budget, and technology? Or *get that big expensive IAM program done faster, and with fewer resources*? And that there is a way to put yourself on even — or superior — technical footing within your IAM/IdM vendors? Do these claims sound provocative? Perhaps a touch bold? I agree — they are. But these things are all very possible. Here is the brief story of how I came to create a work that can stand behind these claims, and how _you_ and your company can benefit. Ever hear yourself saying IAM should NOT be this hard! Or your PM? Director? C-Level Exec / Board Sponsor? I’ve heard it. Countless times. The phrase comes up a lot when I meet with potential clients. In fact, most of my new IAM clients are organizations that have tried IAM once, twice, or even *five times* in the past. They needed the right information to succeed. But if it shouldn’t be any of those things, why is it almost always those things? Frankly, it’s simply a series of misunderstandings about what IAM reallyis, and how it works. Notice I didn’t say “it’s because the budget wasn’t large enough”, or “it’s all about what software package you choose”? How much of a role technology really plays in the IAM world. The right way to create a budget, from an IAM perspective. Differences between process, people, technology and infrastructure — and what this means to IAM. How to break IAM into separate parts, then decide what you really need. Imagine equipping your _entire team_ with the most important and practical IAM knowledge in a way that is usable…right now, today. What would such potential applied IAM knowledge be worth to your company — not to mention…your budget? Besides complexity and expense, there is the challenge of working with vendors. Many businesses find themselves at the mercy of vendors… vendors in the project so deep and so proprietary you can’t pull them out. The right IAM knowledge is your escape key from the IAM project “vendor trap”. And I’m going to share more about that “escape key” in just a moment. My name is Corbin Links. I’ve been in the identity management field (IAM / IdM) for 20 years. (30 years in business total.) I’ve worked with household name clients such as Disney, Cisco, Microsoft, and Intuit. My identity management (IdM / IAM) experience has taken me all over the globe: from the warm beaches of Southern California, to the beautiful chilly north of Finland — and many points in between. I’m an internationally recognized keynote speaker on IAM topics and a known solver of big IAM project challenges. Some have even called me an “IAM Guru”, but that’s not a name I would choose for myself. For fun, I hosted of the longest-running podcast of its type: “The Identity Management Success Show” from 2005 to 2012. And being selected keynote speaker at a major European Identity Management Conference was a real honor. And that’s just Identity Management. My full business career spans over 30 years, with over 25 of them in the Business IT field. “Corbin is that rare combination of technical expertise, business acumen and client relations; able to see the full picture, beyond the technology. Not only is he unquestionably an expert in his field, quality and customer satisfaction is paramount with him. He was engaged on a very difficult project where the scope changed frequently and radically. He was able to come up with solutions creatively to absorb the changes and stay on track, moving heaven and earth to lead the project to a successful conclusion in spite of numerous barriers, always with a positive and supportive outlook. Flings open the shutters of IAM vendor imprisonment and brings in the light. Brings real, vendor-neutral _applied knowledge_ to you and your team. Cuts through the fluff and distracting technology discussions and re-focuses on the key fundamentals. Could literally save you hundreds of hours, or thousands of dollars in wasted, or misdirected effort. Strips complex technical terms, three-letter acronyms (the dreaded “TLA”) and vendor-speak into plain language. Is easy and quick to read. 25+ years in Business IT, and counting. 20 years in identity/access management. Keynote speaker to the European IAM Conference in Helsinki, Finland. Host of the “Identity Management Success” podcast from 2005 – 2012. I’ve seen what works and what doesn’t. It’s one of my personal missions to ensure that organizations spend their money wisely and effectively. LinkedIn-endorsed in dozens of disciplines and technologies. In short, I’m boiling down some of that “been there, done that” experience into an easy-to-use reference. Your “consultant-in-a-box” if you will. Concerned about risk? This is one area of your project life that has no risk whatever. It’s all with me. I offer a simple, iron-clad, money-back guarantee. 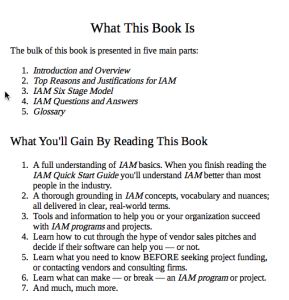 Buy the full IAM Quick Start Guide: Master IAM in 4 Hours or Less book pack. If you’re IAM-related knowledge doesn’t improve in just a few hours, email your receipt “support@iamquickstartguide.com” and simply ask for your money back. We will refund your full purchase price within 48 hours of receipt. A special bonus, full-sized, downloadable copy of my top keynote presentation How To Get IAM Programs Done Right The First Time. I’ve presented this material to audiences paying over $3000 a person. Yours FREE! And then there are 118 full IAM-related definitions in the Glossary. Many of the Glossary definitions are full articles in and of themselves! Nothing is left to chance. Congratulate yourself by taking that first step toward IAM independence! You’re now less than 4 hours away from IAM Mastery. Your time, and the time of your project team is really valuable. 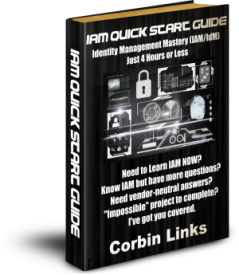 Don’t waste another minute being without this crucial IAM knowledge. Learn identity management today. P.S. I’m so excited for you to have this information, that I’m including my keynote presentation How to Get IAM Programs Done Right the First Time absolutely free! …or invest in industry analyst reports such as Waves and Quadrants — which will run you $500 – $2000 or more! And honestly, after reading IAM Quick Start Guide — you may *still* decide you want some outside help. But this time will be different — much different…Why? Because you’ll be empowered to steer vendor meetings in the ways that are best for your organization. All for just $47.00 USD — that’s less than 10% of the cost of 1 consulting hour! The risk is all mine, and you have nothing to lose except more time, frustration, and money.